Academic acclaimed for 'Nodanith Daruwan Akayen Vatuna' conceptualized, directed and produced by Suranga Lakmal Senevirathne, comes in the form of the programme being prescribed by the Rajarata University as teaching material for the students who follow the internal Degree in Health Promotion, the degree which has been introduced for the first time, at the Faculty of Applied Sciences. Deviating from the traditional path of formula-programming, a young and dynamic producer, script-writer has taken up a radical approach defining the very ethos of the Sri Lankan television production. His series on child psychology titled 'Nodanith Daruwan Ekayen Vatuna', literary meaning falling children from the lap, discussed issues pertaining to rearing children in a household environment. Though the title of the programme was taken from Sinhalese classic Guttila Kavya, Suranga rendered it a new connotation that parents should always keep an eye on children irrespective of their busy schedules and other pursuits. 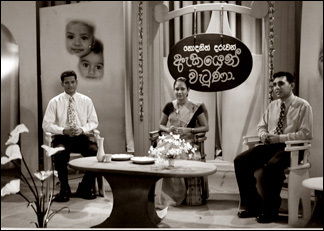 Panel of experts on child psychology and related fields was used for the programme which was moderated by television personality Medha Jayaratne. She was selected for the programme on account of her experience. It is pity that the channel did not understand the value of quality productions though they were highly appreciated by the audience. According to Suranga, in Sri Lankan television visual properties are not being exploited full while sticking to the radio talk-show formula. However, the format for the programme was different in many aspects including the very coloure of the setting. On advice of child psychologist, a pale-green was used for the setting. While two panelists discuss an issue, a video-enactment of the issue is shown from time to time during the discussion to illustrate a point. In some instances, parents and guardians of children were called to the studio. The issues were discussed in a simple Sinhala with an incident to illustrations. Issues such as corporal punishment of children, children's likes and dislikes and formation of ideals (Tharu), birth of second child, gender biased and early childhood, appreciation have been discussed in the programme. In this particular programme, traditional ingredient of a Star (celebrity) or an ideal has been questioned. At the time, a star is defined as a person who can sing, act and dance. When questioned, the parents expressed their aspirations with regard to children. Most of the parents were of the view that their children should be a doctor or an Engineer (Not a kind-hearted doctor or a sympathetic engineer). One of the significant features of the programme was that it was based on research, particularly in household environment. Simple practices and their long term psychological repercussions were discussed in the programme. Among the panel of experts were Lecturer Rajarata University and Adviser, Foundation for Health Promotion (FHP) Duminda Guruge, Executive Director Mel Madura Dr. Manoj Fernando, Sociologist Mangala Randeniya and Director FHP Jinendra Senanayake. For instance, hitting the chair against the child, to please the child is such bad practice which would in the long rung lead to retribution. The programme received wide acclaim and subsequently recommended by academic for university students who follow a Degree in Health Promotion. Speaking on his entry to the field of Television production, Suranga Lakmal Seneviratne states that he joined a production team of a television channel on completion of his studies in the university. Though he had to produce entertainment programme for the channel, Suranga learnt the technical know-how, concept, programme-design, budgeting and executing of a programme. Within constraints, imposed by the channel, it was an impossible task to express innermost creativity of an artist. Artists had to fulfill commercial requirements of the channel. It was rating of programmes which decide priority of the channel in selecting programmes for telecast. Disappointed by the set up in the channel, Suranga tendered his resignation which subsequently helped him to realize some of his artistic goals. Birth of a television channel dedicated to promote artistic legacy of the nation opened up new avenues for talented artists who were eager to express themselves through genuine original programmes based on folklore, idioms and proverbs. Suranga joined the newly formed television channel and produced a programme titled 'Kium Kerum' with Madumadawa Aravinda. The programme was based on expressions, idioms, proverbs, imagery in Sinhala. 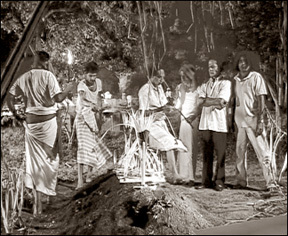 Apart from revealing the story behind the Sinhala proverbs, programme explored the social milieu and traditions and the social norms of the time. Format of the programme was that of a competition and a fun game. A resource person would explain the socio-economic background which led to the proverb. School students participated in fun games. In order to gather material, Suranga had to devour the corpus of knowledge on Sinhalese proverbs and stories in addition to collecting folk tales from villagers including his granny's bed-time stories. Perchance he came across the phrase 'Nodanith Daruwan Ekayen Vatuna' in Gutila Kauya which subsequently became the title for his series on child psychology. Perhaps, this period in his career was more fruitful than preceding years which were more or less confined to commercial productions. One of the successful productions was 'Hela Sinemawe Anderela' (Comedian in Sinhala cinema) with Bandula Wijeweera as presenter. Back ground information and analytical account of comedian of diverse eras were presented to the audience together with relevant clips from the original films. For instance Joe Abeywickrama's comedian character in the film 'Sweep Ticket' shed light on the prevalent social norms. He (Joe) pushes a girl in jeans in a scene in a train, having been mistaken her for a man. Generation of comedians featured in the programme included Anthony C. Perera, B.S. Perera, D.R. Nanayakkara. 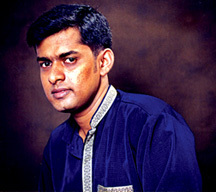 Following his creative stint in the channel came a period of interregnum where Suranga had no particular task to perform. It was during this period, he conceived the idea of directing a teledrama of his own. By the time Suranga had amassed experience in every segment of production process including working with foreign directors and conceptualising and script-writing for number of productions. The idea, thus, conceived gradually grown up to be a fully fledged script based on national heritage and archeological artifacts. Script of 'Angaeei' (souk), teledrama unfortunately failed to attract producers who are used to financing formula-teledramas with romantic storyline. On flimsy grounds, five producers declined to invest in 'Anganee'. So the burden of producing 'Anganee' fell upon Suranga who produced the teledrama with little money he saved and the rest borrowed from commercial banks. Speaking on ground realities in Sri Lanka for artists, Suranga acknowledged the fact that financial constraints had almost compelled artist to compromise with creativity. 'Anganee' is significant for Suranga on several accounts. It is entirely shot in the precincts of the sacred city of Anuradhapura against the back drop of ruins. Anuradhapura is where Suranga was born and bred with heap of nostalgic memories. Apart from highlighting archeological artifact-hunters, Anganee explores the sub-culture associated with the sacred city. The archeological sites and the sacred city, offer host of employments ranging from labourers in excavating sites, shoe-keepers in the sacred city, fishermen and flower-venders. Their lives revolve around the aged old ruins and the sacred city. It is a souk where even emotions are being traded in exchange for money. 'Anganee' could subject to many readings. 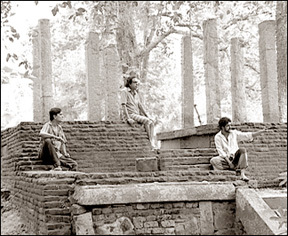 The ultimate message of the teledrama is that the conventional protests against treasure hunters would not bear fruits. The drama will be a journey of soul searching into collective conscience and the vanishing heritage in priceless archaeological artifacts. Speaking on the art scene, Suranga states that most of the actors and actresses are those who take acting lightly. They are also total failures at school. Some of the directors are also those who have little or no understanding of the medium who know only to say 'Action' and 'Cut'. Some directors could not even tolerate watching a Perahera. They not even respond to nature. Although the acting is the recreation of characters, it is pity that actors and actresses have not understood this and try to judge characters as soon as they get hold of a script. This has been largely responsible for the deteriorating standards in art in Sri Lanka and the present predicament in the industry. He is of the opinion that entertainment also differs from person to person.